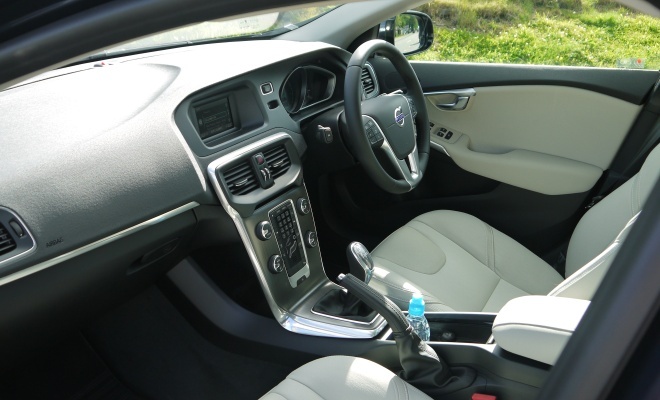 Like all modern Volvos, the new V40 is stuffed with advanced electronic systems, so it takes a while to spot where the Swedish engineers have hidden the handbrake. On the larger S60 there’s a small flap nestling between the steering column and the driver's door, but there’s no handbrake there today. Eventually I spot what I’m after – a large, leather-bound rod poking up between the front seats. Who’d have thought to look there? To be fair to my own stupidity, Volvo hasn't bothered to move the old-fashioned, analogue lever in the transition from left- to right-hand drive. 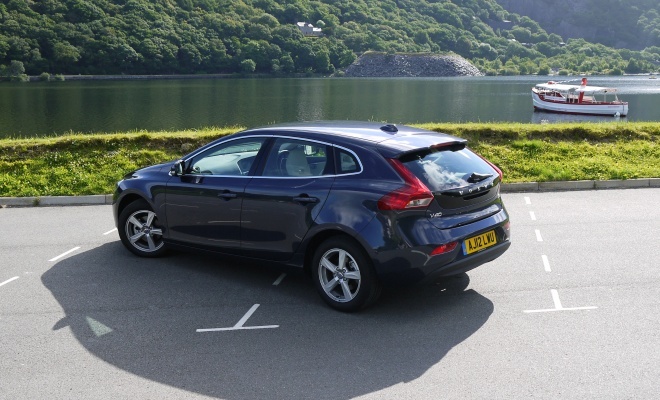 As a result the handbrake nestles alongside the passenger seat in UK models, unexpectedly distant from the driver. Grabbing it can often involve an accidental brush of your passenger’s thigh, which may or may not be welcome. It’s hard to fathom why Volvo didn’t solve this obvious annoyance by going electronic in what is otherwise a carefully conceived, state-of-the-art product. Fortunately the remaining controls present fewer challenges. The perspex-topped gear lever can feel a bit slippery, and the steering wheel seems to be modelled on a 50-pence piece rather than a circle, but overall the car is relaxing and easy to drive smoothly. The gearchange is quick and slick, the steering weight feels good, and the pedals are well spaced and evenly weighted. There’s no room for a clutch-side footrest, mind you, another casualty of the mirror-image switch to UK spec. And neither is there the option of an auto box in this D2 model – for effortless progress you have to upgrade to the more powerful D3 or D4 engine. But it’s the D2 model in middling SE trim, priced from £21,345, that Volvo predicts will be the big seller, accounting for the majority of UK sales. Interest will be driven primarily by the car’s exceptionally low CO2 figure of 94g/km, which rises to only 99g/km if you upgrade to from 16- to 17-inch alloys. Either way, the D2 will avoid tax discs, congestion charges, and excessive tax bills while still looking handsome, chiselled and not remotely like it runs on lentils. Such a low CO2 figure illustrates how adept manufacturers have become at achieving economy without apparent sacrifice. 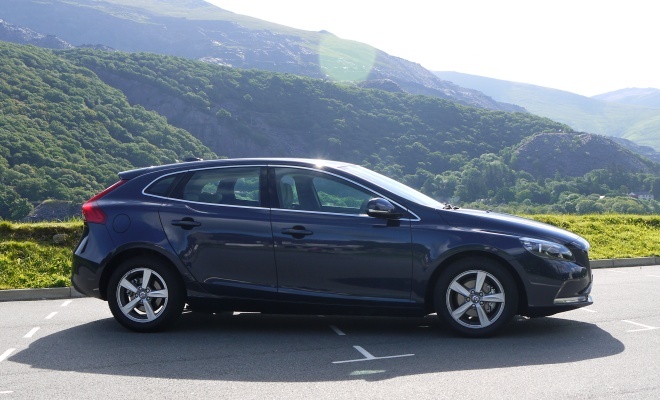 The V40 in D2 trim feels solid and luxurious, includes climate control, eschews impractical gearing and doesn’t feel like a slug that’s towing a caravan with two flat tyres. It does utilise stop-start to avoid fuel wastage, boasts a slippery 0.29 drag coefficient, and also employs an intelligent alternator to relieve unnecessary engine load. The end result feels like a real cake-and-eat-it car. While outright power has clearly been sacrificed in pursuit of cleanliness, the 115bhp D2 diesel engine never feels embarrassingly underpowered. 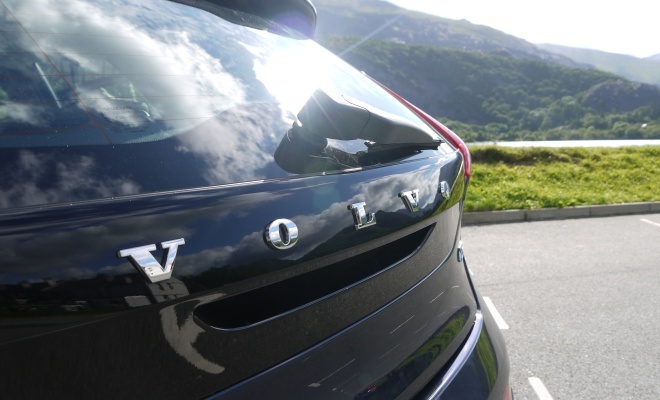 With 270Nm of torque to call upon it can shrug off the V40’s 1,380kg mass and gambol up steep hills when asked, as long as you wind the revs up high enough to keep the turbo singing. Below 2,000rpm, grunt is most noticeable by its absence. The stopwatch confirms that the D2 is not a quick car – requiring 12.3 seconds to reach 62mph. By contrast you can get there in just 8.3 seconds in the automatic D4 , the quickest diesel in the range, which incidentally is the V40 I’d choose if money and fuel economy were miraculously no longer a concern. At motorway speeds, slotted into fifth or sixth gear, the D2 feels relaxed, very quiet, and exceedingly comfortable. 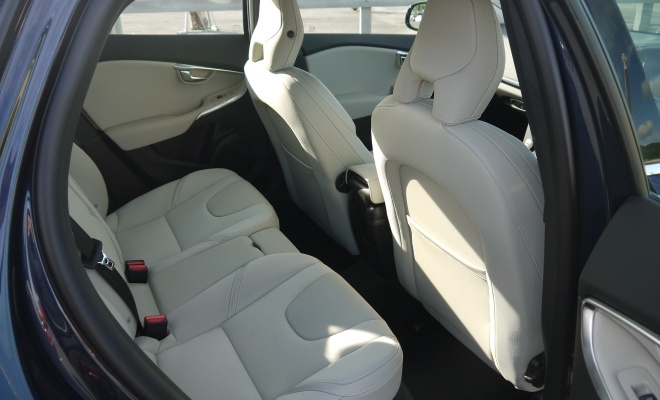 Whether you choose manual or electric seats, cloth or leather upholstery, all are excellent chairs providing support in the right places and plenty of adjustability. If you can’t get snug in a V40, best seek out an osteopath. Some of the optional electronic driver aids are in evidence at high speeds. 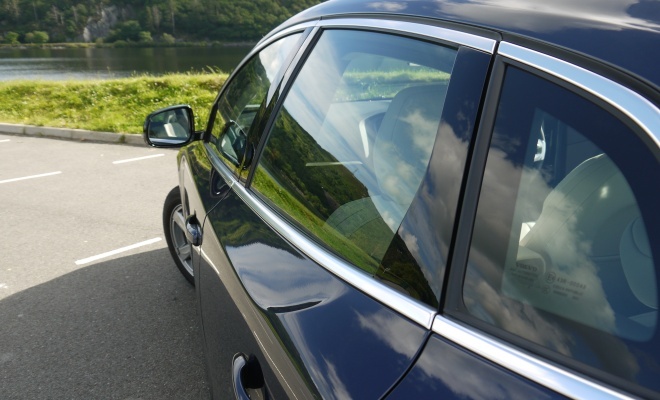 The £500 blind-spot safety system will flash an amber lamp in warning whenever a car is alongside or even some way behind, visible whenever you glance at the relevant door mirror. And a red collision danger light will flash and squawk a warning if you close in too tight to a car in front as you move to overtake – the big warning lamp is positioned on the dashboard top so as to be visible reflected in the windscreen as you look ahead. It’s there, of course, to wake you up if you’re about to rear-end something. The driver alert is part of a £700 bundle that includes lane-departure warnings through the steering wheel. At speeds below 50km/h (about 31mph), the standard-fit City Safety System will bring the car to a shuddering halt if you fail to notice an impending insurance claim, and if things go completely pear-shaped and you knock down a pedestrian, there’s the world’s first under-bonnet airbag to try to soften the blow. It too is a standard feature across the range. It’s probably preferable to think about how pleasantly Swedish the car is to sit in, rather than contemplate any unfolding crisis. Volvo’s trademark “floating” centre console is now joined by another lovely interior detail – a frameless rearview mirror. Like the centre console, it doesn’t actually make the car any better, but it does make it feel more special. To accentuate that feeling it may be worth splashing £350 on the digital dashboard (and illuminated gearknob, no less) which ousts the analogue dials in favour of a crisp and bright digital information screen. It can mimic three different varieties of instrument layout, called Elegant, Eco and Performance. 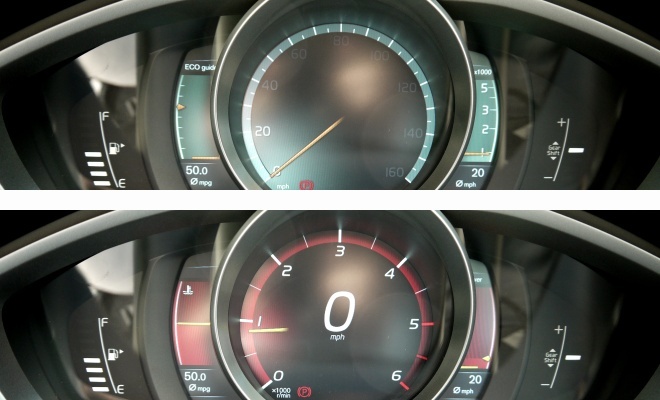 I liked both the Eco and Performance options, the first for its clever and helpful economy meter, the latter for its large and clear speed readout. Sadly you can’t call up both the digital speedometer and the eco meter at the same time. Maybe there will soon be an app for that – there’s nothing to stop Volvo developing dealer-fit upgrades for the software. 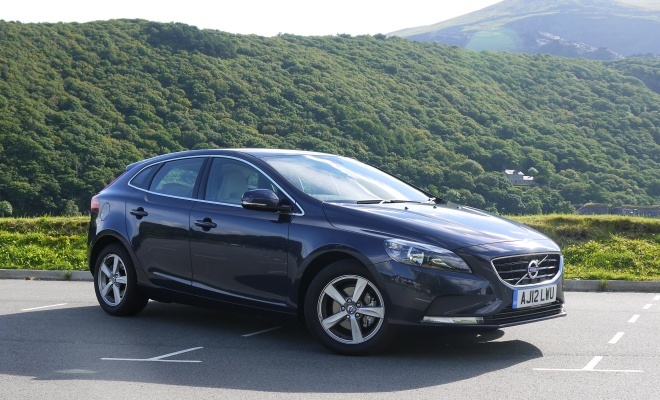 After a couple of days trying out various different V40s, it became abundantly clear that Volvo’s new baby deserves to be a big hit. It’s well equipped for the price, supremely comfortable, feels poised on back-roads and relaxed on motorways, and offers a uniquely welcoming interior. It’s not perfect, by any means, but it deserves a full deck of five stars in my book.